Newspaper report from November, 1934 about an accident at Moss Side Crossing in which Thomas Morley of Park Road, St.Annes, died. ST.ANNES CAR CRASHES ON RAILWAY. Struck by Train at Moss Side Level Crossing. A motor car driven by a St. Annes resident was struck by a train at Moss Side level crossing on Wednesday night. The car was smashed into bits and the driver was picked up from the side of the line dead. He. was Thomas Morley (64), of 5, Riley Avenue, St. Annes, the Principal of Morley's Cafe, Limited,Tulketh Brow, Ashton, Preston. The gates at the little village station, well known to Fylde travellers either by car or rail, had been closed against traffic to allow the 5-10 p.m. train from Blackpool Central to Kirkham to pass. The cause of the accident is obscure, but it appeared that the motorist, who was on his way home from business when the accident occurred, crashed to the near-side gate. The stop was broken and the gate swung inwards. Moss Side Railway Station, showing the level crossing where Mr Thomas Morley, of St.Annes, crashed and met his death. 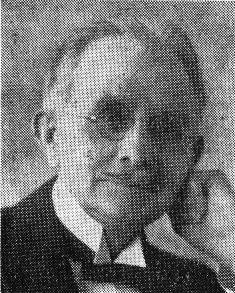 November 1934. Then the car continued its course cross the two sets of metals and struck the offside gate on the other side. At the moment the train came along at about 40 miles an hour, struck he car and smashed it into pieces. Part of the car was thrown for some yards along the line and was jammed against a " bunker"-a low open brick structure for the storing of coal for the signal box fire. The driver of the train immediately applied the brakes and the train was quickly brought to a standstill. A search was made along the line, which was strewn with, wreckage, and the body of Mr. Morley, mixed up with parts of the car was found lying alongide the track. Apart from slight damage to the engine, the train took no harm, and later it continued its journey to Kirkham, arriving about 45 minutes late. The rail traffic generally had to be slowed up. 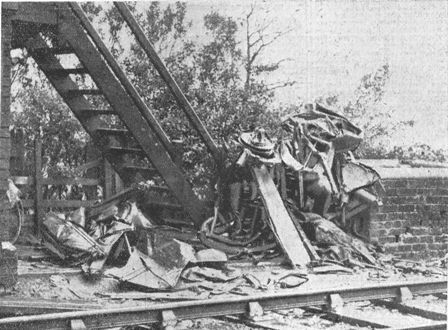 A close-up view of the tragic wreckage after the train had smashed the car into a thousand fragments. The gates were put out of action by the crash of the car and road vehicles were piloted over the crossing by means of lamp signals. The villagers were greatly alarmed by the noise of the crash and the screech of the brakes as the train was stopped, and they rushed to the scene, rendering ready help.